The QE-CURRENT-485 is the first ALL IN ONE CURRENT CONVERTER & ANALYZER of the market. One DIN rail size, suitable for electric distribution boxes, allow you to measure the values of CURRENT measured by all the isolated primary current sensors available on the market (Rogowski probes, Split Core CTs, Hall's effect sensors, 5A/1A secondary, 0...333mV or 0...1V secondary). 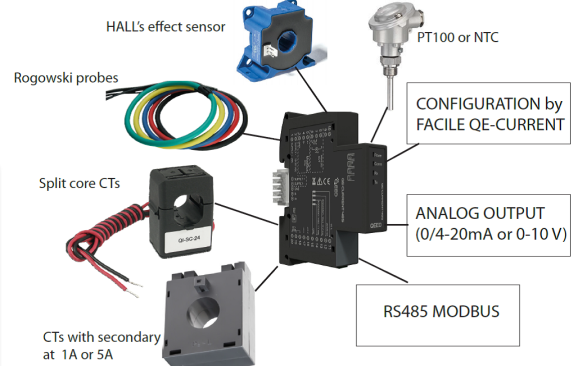 Analog output and RS485 Modbus RTU available.